"John shared his deeply impactful story with our graduating students. He wove together many threads; road safety, personal responsibility and accountability, overcoming adversity, and mental and emotional well-being. 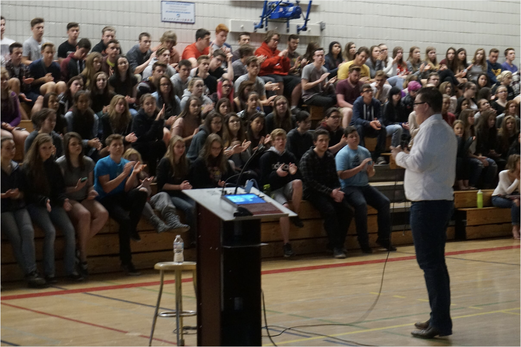 Not many people can command the full attention of 250 youth but John's personable manner, sincerity, and ability to relate to our students kept them completely engaged. 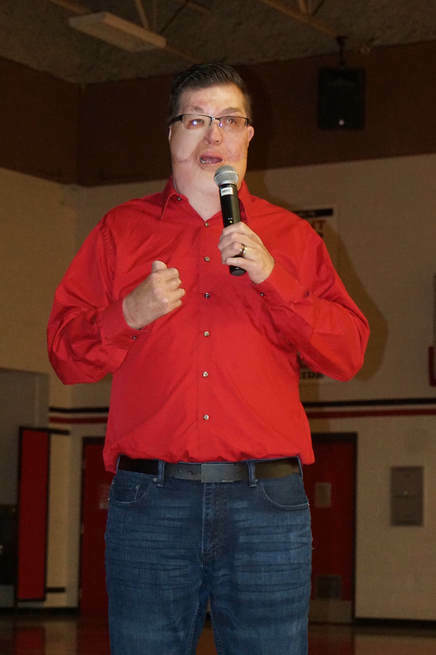 Many of our students thanked John personally at the end of the presentation and were extremely appreciative that he shared his courageous experience. We will definitely have John present for our students again!" John has been impacting audiences for over 16 years. Having delivered over 600 keynote presentations to date, his work has influenced hundreds of thousands of people and families across North America. It is his aim, and now life’s work, to use all that he has learned and experienced to help others. Far too often we give away our power and find ourselves dissatisfied with life and OUR career. We blame others for our problems, our short-comings and lack of satisfaction in life. What if you (saw) truly felt that you could you could have anything you wanted in life and that you could have the life you desire? In this keynote presentation, John talks about how he took responsibility for his life and how that helped him to get his life back. He explains how personal accountability helped him overcome a fatal car crash that took the lives of three of his best friends; a crash that left him with life-threatening burns to 75% of his body. He shares the secret powers of being responsible for his past choices and actions and for the direction his life has gone. John lives an extraordinary life because he discovered the potential of being responsible and accountable for everything that has or hasn't happened in life. John shares about blame, anger and resentment and how these rob us of power when not dealt with. This is a 45-90 mins keynote presentation. ​ This can either be a keynote presentation or customized to be a half-day or full-day workshop. - You have the power to choose to be responsible in all areas of your life. - Personal accountability can boost your performance, productivity, and your level of satisfaction at work and at home. - You can access incredible freedom in letting go of the past through forgiveness. Leadership Meetings, Conferences and/or Workshops, Professional Development Conferences and Workshops, HR Conferences and Workshops and many more! Today's youth are changing the world every day. There are many youths with so much to offer, but find it hard to find their own voice and to find the power to share their passion with the world. Inside of this keynote, the audience will learn how John turns a tragedy into a powerful message that has helped hundreds of thousands of people across North America. He shares how he got started in the professional speaking world and how he has enrolled many people to partner with him. He also shares what he had to overcome to be able to share such a tragic event over and over again. His passion for making the difference fuels this presentation. Help your youth find their voice! - You will walk away empowered, motivated and inspired. - You will discover something new that will empower you in sharing your passion and leadership with the world. - You will see that you can manifest change and the world will be altered because of this! 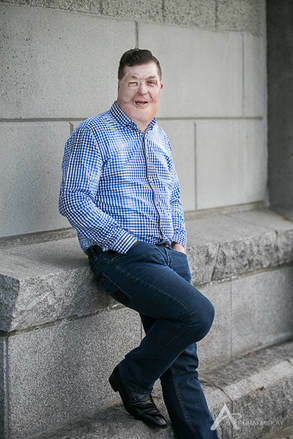 Living with facial disfigurement in today's superficial world can be very challenging. John shares how he not only lives in this superficial world, but how he thrives in it. John will share his compelling story of overcoming adversity and the struggles of surviving a fatal vehicle crash when his three friends didn't. He also shares the struggles of undergoing over 35 surgeries to correct the damage caused by the fiery car crash. He also talks about dealing with the loss of his friends. This presentation intends to motivate and inspire others to find in themselves the power and strength to deal with difficult times in their lives. This is a must-see presentation and is great for any audience. - You are not defined by your looks. - You are not who you wound up being. - You are not what happened to you. - You get to create the life of your dreams. Workplace and Road Safety impacts every one of us. Enrolling others in workplace and road safety is sometimes challenging. Some people don't see the impacts or dangers in making poor, unsafe choices at work or in vehicles. In this presentation, John shares the impacts of being involved in a fatal vehicle crash. He shares the physical challenges of living with a damaged body caused by the fiery car crash that he survived. He also shares the emotional and psychological impacts of living with a burned damage body but also surviving when his friends didn't. He also talks about the importance of making good safe choices. The intent of this presentation to motivate others to become safer at work and on the roadways and to start to create a safer workplace culture. Everyone wins when we are making safer choices. - You will see that safety is everyone's responsibility and impacts everyone. - You will experience what one goes through when involved in an accident, workplace or not. - You will see the key benefits of making safe choices at work or in life. OHS Meetings and Conferences, Safety Stand Downs, Safety Meetings, Safety Managers Meetings and Conferences, Road Safety Meeting and Conferences, School Safety Assemblies and many more! John has been feature in print, radio and TV. Here is a sample of some the news organizations and publications that has featured John and his work. Click on the image to read the articles, listen to or watch the interviews. If you are looking for a captivating motivational speaker that has literally seen and done it all, and one that has an extremely powerful message, book John today.